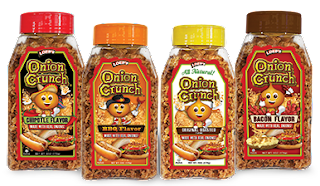 Girly Girl Giveaways: Onion Crunch Review and Giveaway Yum! Yum! Yum! Onion Crunch Review and Giveaway Yum! Yum! Yum! Sometimes all it takes to make a good meal taste even better is an easy to reach for easy to add tasty topping like Onion Crunch. I have had months to review/taste test Onion Crunch on a variety of foods for a fair review and I let my kids in on the taste testing too. They loved the opportunity and the results as much as I did. What is Onion Crunch? It is onion bit toppings made with real onions that can be put on a variety of foods. It is an inexpensive all natural Kosher (parve), vegan and non-gmo food product, low in sodium, carbs and also has 0 grams of cholesterol and of trans fat. In addition it is made up of only 4 ingredients: onions, oil, flour and salt. The taste test: the first day the box of Onion Crunch samples arrived at my home I poured some in my hand to taste. It tastes like real onion, sweet crunchy onion pieces. After that I have topped a variety of meals: salads, homemade and store bought lasagna, homemade soups, pizza, beans, etc., with Onion Crunch. My kids and I enjoyed experimenting topping meals with Onion Crunch to see what we liked it on best. We found we liked it best with lasagna and salads because it added the perfect texture to these dishes, but I was also surprised to find out how much I liked it in soups, especially by homemade beef stew. Sometime this month I plan to top my stuffed bell peppers with it. The crunchiness of Onion Crunch isn’t like a crispy chip or toasted bread, but more like battered onion rings in tiny pieces. My 4 year old liked Onion crunch so much I often found him sneaking into another room from the kitchen eating Onion Crunch from his palm. It’s healthier than candy! I'd like to top a pulled pork sandwich. I used Onion Crunch on a pork roast last night. The flavor and texture were a great addition. Just had Onion Crunch on my eggs- fantastic! We put Onion Crunch on Baked Potatoes. Yum Yum Yum. I think they'd taste good on chili. I like on facebook under username Jennie Tilson. I would use it to coat chicken. I would probably put it on top of my salad. I would top my salads with it. I would add it to my salad!